A few weeks ago I turned 50. It fits like a pair of sleek black leather boots. It hit. Suddenly I had the urge to chronicle my 50s. The writer who has lived inside me from as far back as I can remember came to even greater attention at the idea of releasing ideas, of freeing thoughts held back out of self-consciousness. 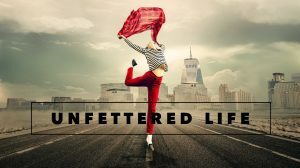 I decided I wanted to be unfettered. Hence the birth of Unfettered 50, the portion of this blog dedicated to thoughts from that place. Readers can continue to come to my main blog and find posts in the categories of Write Thinking and Unfettered 50 mixed together, or choose to use the navigation on the upper left and just read entries under one of those categories. I am so excited about challenging myself to be my most authentic self in this space. What a wonderful pull to action. On the morning of my 49th birthday a few good things happened, some of them really good choices. One of those choices was my decision to treat myself to online goodness instead of going to the news and my other favored web distractions. I chose to read me up a serving of nancola. Wow. It has been a few weeks since I’ve had the privilege of having an in-person conversation with its rather wise and inspiring author and I was floored at the relative timeliness of her thoughts. By the mere attempt at presenting our most “authentic self” to the world, we are not only being true to ourselves but are indeed teaching others. While I have not chosen the particular medium of unfettering my own arts & letters, more and more I think I see it’s worth and reason. History must teach us ‘something’ (that’s a turn an an old Sting song). By offering up our best self we do give an enduring gift, by being free, consciously, others too may learn that they too can be. Run-on sentences can be effective. The number of candles can add up to something … but it’s up to us. Thank you once more Nancy and especially for showing us the unfettered way to make birthdays count. I take it from this post that your birthday was recently — Happy Birthday! I am so humbled and delighted by your feedback and reaction to my writing. It means so much to know there are readers who enjoy what I’m expressing and come back for more.